Every single one of these assertions is demonstrably false. …One of the many problems with a VAT is that it is a hidden levy. …VATs are imposed at each stage of the production process and thus get embedded in the price of goods. And because the VAT is hidden from consumers, politicians find they are an easy source of new revenue – which is one reason why the average VAT rate in Europe is now more than 20 percent! …Western European nations first began imposing VATs about 40 years ago, and the result has been bigger government, permanent deficits and more debt. According to the Economist Intelligence Unit, public debt is equal to 74 percent of GDP in Western Europe, compared to 64 percent of GDP in the United States (and the gap was much bigger before the Bush-Obama spending spree doubled America’s debt burden). The most important comparison is not debt, but rather the burden of government spending. …you don’t cure an alcoholic by giving him keys to a liquor store, you don’t promote fiscal responsibility by giving government a new source of revenue. …To be sure, we would have a better tax system if proponents got rid of the income tax and replaced it with a VAT. But that’s not what’s being discussed. At best, some proponents claim we could reduce other taxes in exchange for a VAT. Once again, though, the evidence from Europe shows this is a naive hope. The tax burden on personal and corporate income is much higher today than it was in the pre-VAT era. 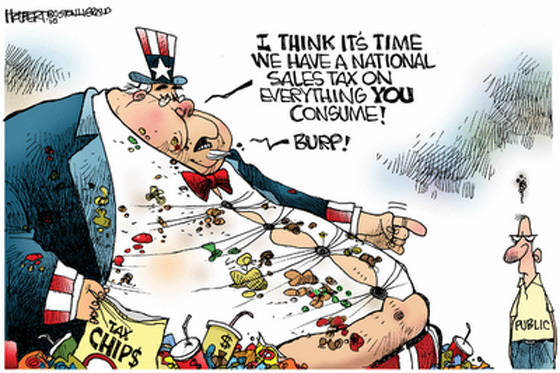 …When President Obama said the VAT is “something that has worked for other countries,” he should have specified that the tax is good for the politicians of those nations, but not for the people. The political elite got more money that they use to buy votes, and they got a new tax code, enabling them to auction off loopholes to special interest groups. I’ve already posted two other cartoons on this issue (here and here), but can’t resist posting another. As with much humor, this cartoon cleverly captures the underlying reality. In this case, the politicians want a value-added tax so we pay more to finance their excesses. I’ve already commented on the proposal from the Chairmen of President Obama’s Fiscal Commission (including a very clever cartoon, if it’s okay to pat myself on the back). Now we have a similar proposal from the so-called Debt Reduction Task Force. Chaired by former Senator Pete Domenici and Clinton Administration Budget Director Alice Rivlin, the Task Force proposed a series of big tax increases to finance bigger government. I have five observations. 1. Notwithstanding a claim of $2.68 trillion of “spending cuts” during the 2012-2020 period, government gets a lot bigger during the decade. All of the supposed “cuts” are measured against an artificial baseline that assumes bigger government. In other words, the report is completely misleading in that spending increases get portrayed as spending cuts simply because government could be growing even faster. Interestingly, nowhere in the report does it show what total spending is today and what it will be in 10 years, presumably because the authors realized that the fiction of spending cuts would be hard to maintain if people could see real-world numbers showing the actual size of government now and in the future. 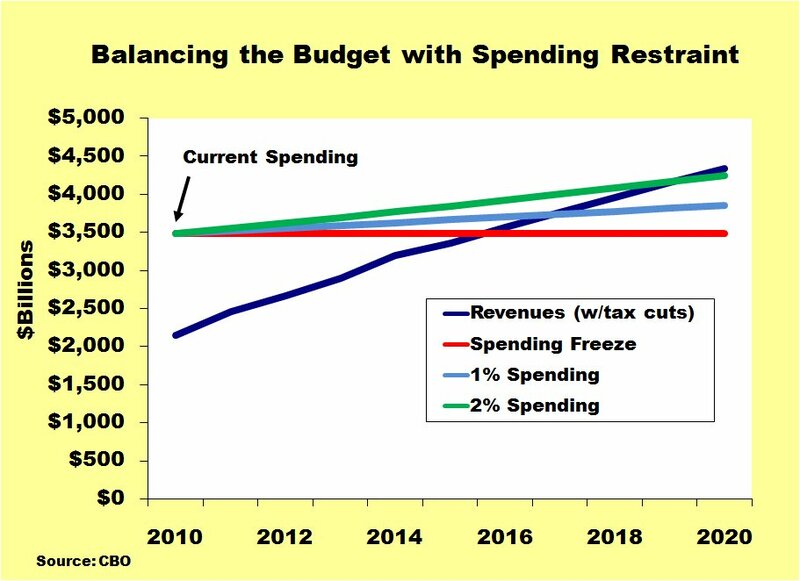 This chart shows what it would actually take to balance the budget over the next 10 years – and these numbers assume all of the tax cuts are made permanent and that the alternative minimum tax is extended. 2. The Task Force proposes a value-added tax, which is estimated to generate more than $3 trillion between 2012 and 2020. They call this new tax a “debt reduction sales tax” and I can just imagine the members giggling as they came up with this term. They may think the American people are a bunch of yokels who will get tricked by this language, but one can only wonder why they think making our tax system more like those in Europe will lead to anything other than more spending and less growth. 3. The Task Force proposes to dramatically increase the scope of the Social Security payroll tax. Since this is something Obama called for in the campaign and also something endorsed by the President’s Fiscal Commission, this proposed tax hike should be viewed as a real threat. I’ve explained elsewhere why this is bad tax policy, bad fiscal policy, bad entitlement policy, and bad Social Security policy. 4. To add “stimulus” to the package, the Task Force proposes a one-year payroll tax holiday. 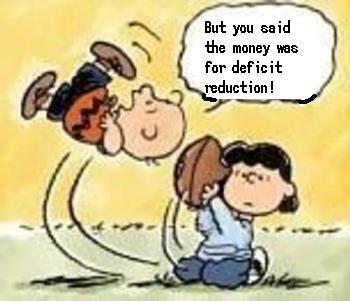 The good news is that they didn’t call for more spending. The bad news is that temporary tax cuts have very little pro-growth impact, especially if a tax cut will only last for one year. Unfortunately, the Task Force relied on the Congressional Budget Office, which blindly claimed that this gimmicky proposal will create between 2.5 million-7.0 million jobs. But since these are the geniuses who recently argued that higher tax rates boost growth and also claimed that Obama’s faux stimulus created jobs, those numbers have very little credibility. 5. While the Task Force’s recommendations are unpalatable and misleading, there is a meaningful distinction between this plan and the Obama Administration’s fiscal policy. The Task Force assumes that government should get even bigger than it is today, but the Obama Administration wants government to grow at a much faster rate. The Task Force endorses massive tax hikes, but generally tries to avoid marginal tax rate increases that have especially large negative supply-side consequences. The Obama White House, by contrast, is fixated on a class-warfare approach to fiscal policy. One way of characterizing the different approaches is that the Task Force represents the responsible left while the Obama Administration represents the ideological left. Families are avoiding holidays Egypt and Caribbean because of the high cost of air taxes – even before the hike in passenger duty that comes into place on Monday. …The duty, which is paid by all travellers on leaving Britain and added automatically to the price when a ticket is booked, is to increase by 50 per cent to some destinations. It is the second significant rise in two years, and figures show that previous hikes have already influenced people’s choice of holiday destinations. …Bob Atkinson, travel expert at Travelsupermarket.com, said: “Families looking to book for this winter and summer next year will be faced with tax rises of up to 54 per cent on their family holidays. This tax rise is completely out of line with inflation and bears no relation to the original purpose of the tax. …The tax was introduced in 1994 at the rate of £10 on long-haul flights, but increased by the previous Government, which said it was a necessary “green measure”. …The increases mean a family of four flying to the Caribbean will pay £300 in duty compared with the old rate of £200 or £160 last year. Willie Walsh, the chief executive of British Airways, has branded the higher taxes a “disaster”. Earlier this month, he called the duty a “disgrace”. Why Are We Paying $100 Million to International Bureaucrats in Paris so They Can Endorse Obama’s Statist Agenda? There’s a wise old saying about “don’t bite the hand that feeds you.” But perhaps we need a new saying along the lines of “don’t subsidize the foot that kicks you.” Here’s a good example: American taxpayers finance the biggest share of the budget for the Organization for Economic Cooperation and Development, which is an international bureaucracy based in Paris. The OECD is not as costly as the United Nations, but it still soaks up about $100 million of American tax dollars each year. And what do we get in exchange for all this money? Sadly, the answer is lots of bad policy. The bureaucrats (who, by the way, get tax-free salaries) just released their “Economic Survey of the United States, 2010” and it contains a wide range of statist analysis and big-government recommendations. The Survey endorses Obama’s failed Keynesian spending bill and the Fed’s easy-money policy, stating, “The substantial fiscal and monetary stimulus successfully turned the economy around.” If 9.6 percent unemployment and economic stagnation is the OECD’s idea of success, I’d hate to see what they consider a failure. Then again, the OECD is based in Paris, so even America’s anemic economy may seem vibrant from that perspective. The Survey also targets some very prominent tax loopholes, asserting that, “The mortgage interest deduction should be reduced or eliminated” and “the government should reduce further this [health care exclusion] tax expenditure.” If the entire tax code was being ripped up and replaced with a simple and fair flat tax, these would be good policies. Unfortunately (but predictably), the OECD supports these policies as a means of increasing the overall tax burden and giving politicians more money to spend. But even that’s not enough. The OECD then puts together a menu of additional taxes and even gives political advice on how to get away with foisting these harsh burdens on innocent American taxpayers. According to the Survey, “A variety of options is available to raise tax revenue, some of which are discussed below. Combined, they have the potential to raise considerably more revenue… The advantage of relying on a package of measures is that the increase in taxation faced by individual groups is more limited than otherwise, reducing incentives to mobilise to oppose the tax increase. If you’re still not convinced the OECD is a giant waste of money for American taxpayers, I suggest you watch this video released by the Center for Freedom and Prosperity about two months ago. It’s a damning indictment of the OECD’s statist agenda (and this was before the bureaucrats released the horrid new “Economic Survey of the United States”).